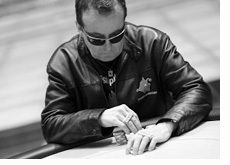 Dave "Devilfish" Ulliott, certified player and bonafide ladies man, plans on cashing in on his name as his firm, Devilfish Gaming, has initiated plans to go public. Devilfish Gaming is planning a listing on the Plus Markets, a junior exchange formerly known as Ofex. The company is hoping for a 3.2 million pound listing. According to industry estimates, Devilfishpoker.com currently has 6000 registered users of which 700 are real-money players. A 3.2 million pound listing (which is about $6.4 million US dollars) would seem to value the company quite highly, considering there are only 700 real money players on the Devilfishpoker.com site. Obviously the company is hoping to capitalize on the name of Dave Ulliott and spend some of that newly minted money on marketing. Devilfishpoker.com is a skin of Ultimatebet.com. According to published reports, the "Devilfish" has a 27.8% stake in the site, making him the largest shareholder. Paul Barnes is the company's chief executive, and the site is chaired by Kevin Leech. Hichens, Harrison & Co is serving as the company's corporate adviser. According to a report in the Times Online, Devilfish will stand to gain 1 million pounds if this flotation goes through.